With the world gone playlist crazy, you would expect more record labels to be exploiting the idea of "playlist" compilations of their back catalog pieced together by famous musicians. Where, for example, is Fantasy's Stax According to Joss Stone, MCA/Universal's Jagger/Richards Play Chess & Checkers, or Sony/BMG's slightly more obvious The BossList: 25 Tunes from Bruce Springsteen's iPod? Who knows, maybe rock stars don't like being downgraded into deejays. In the '90s, Polygram introduced the Verve Ultimate Series, a well-received reissue series compiled by current jazz musicians. From the depths of the Verve vault emerged some two dozen compilation albums, including Ultimate Ben Webster (selected by James Carter), Ultimate Bud Powell (selected by Chick Corea), and even a few compilations of the compilations (Ultimate Jazz, Ultimate Bebop). Arranged chronologically, Mayall's boogie-woogie playlist is bookended by an alternate take of Cow Cow Davenport's "Cow Cow Blues" (recorded in 1928) and Otis Spann's "Otis in the Dark" (1960). In between, we get two radically different versions of "Pinetop's Boogie Woogie" (by Walter Roland and Cleo Brown), a few undisputed classics (Big Maceo's "Chicago Breakdown," Little Brother Montgomery's "No Special Rider"), and several obscure gems plucked from Mayall's collection of 78s. 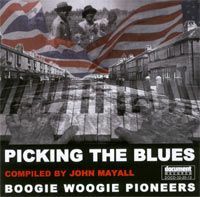 As you would expect, many of the selections on Picking the Blues (15 out of the 22) have already been reissued on previous Document anthologies. Among the seven tracks being reissued on Document for the first time are Blue Note sides by Albert Ammons ("Bass Goin' Crazy") and Pete Johnson ("Holler Stomp); Jay McShann's "Vine Street Boogie"; Montana Taylor's "Indiana Avenue Stomp"; and "Slim's Boogie," recorded by Memphis Slim in 1946. Mayall's liner notes are sprinkled with anecdotes about how he first discovered these players. We learn, for example, that Cripple Clarence Lofton's "In the Mornin'" was a rare 78 that Mayall borrowed from Manchester pianist John Fish in 1950. And "Chicago Breakdown" first reached Mayall's ears via French short-wave radio, during his army service in 1952. Two of the best tracks in this collection are also sure to generate big laughs: Pinetop Smith's "Jump Steady Blues" (with its jive-talking intro exchange between Pinetop and Mayo Williams) and Cleo Brown's "Boogie Woogie" (with Brown's hilarious public-service-announcement style instructions on how to boogie, then stop, then mess around). Picking the Blues wraps up with Speckled Red remaking "Early in the Morning" (from a 1956 session), and finally Otis Spann crushing the keys on one of his best solo performances, "Otis in the Dark" (from the Candid LP Otis Spann Is the Blues). By the end of the album, if you hear a thumping noise in your head, that's just the residual walking bass of Spann's left hand. It tends to linger. Let's hope Document has a few more of these "star compilation" reissues in the works. Maybe The Okeh Records Divas -- Compiled by Bonnie Raitt? Or The Untouchable Lonnie Johnson -- Compiled by B.B. King? I'm not being too demanding, am I?